A colourful salad of chicory, radicchio and capers is my idea of heaven at the moment. Something crunchy, something bitter, something piquant - and all bound together with a mustardy dressing with a slick of honey. It's the sort of sharp, clean taste that lifts the spirits in a wet sludgy November. To me, the chicory on the left is a green, or white, or witloof chicory. The plant has been partially grown in darkness, ie, forced, in order to get the tight blanched head of leaves, or chicon. 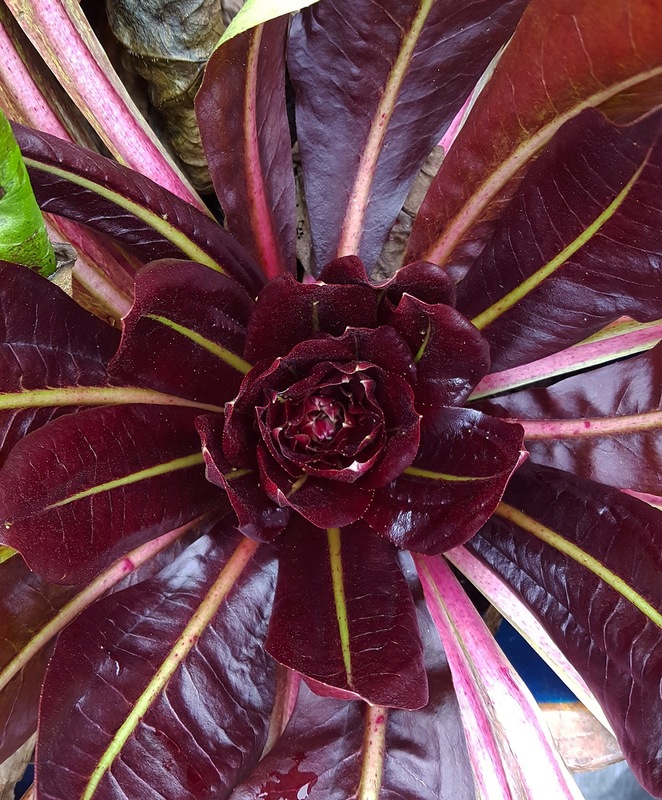 The middle picture is red chicory, the Italian Rossa di Treviso, and on the right, with the round head and variegated green and red leaves, deep crimson towards the heart of the plant, is radicchio. They are all chicories, types of Cichorium intybus. None of them are endive, which to me is like a frilly lettuce with thin crunchy stems and is a Cichorium endivia. 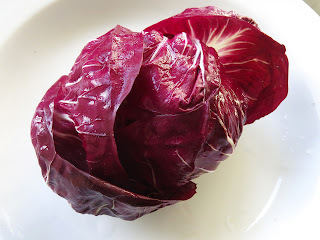 The beautiful rich red colour of the radicchio and the Rossa di Treviso deepens as the temperatures drop and autumn turns into winter, although the RHS also suggests that the change in day length may contribute to the colour development. Chicory isn't a difficult vegetable to grow, although it does spend a lot of time in the ground. Radicchio and red chicory are probably the most straightforward: sow in April or May, either in situ or in modules. I do the latter simply because I don't usually have the space in the open ground in May. By July, when I plant them out, something else will have been harvested and there will be room for them. This year I circumvented the space problem by transferring the seedlings to large recycling boxes - trying to avoid the slugs and snails which had overrun all my veg beds earlier this year. They grew very well although I had to knock up a homebrew irrigation system using a 2ltr water bottle and a ceramic cone in order to stop them from drying out. The elegant pale chicons that we tend to think of as chicory here in the UK are achieved by cutting off the leafy growth in winter and letting the plant regrow its budding leaves in total darkness - this is the process known as forcing. 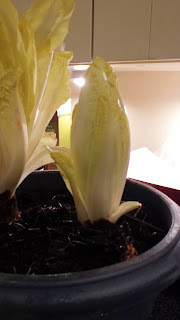 We tried this out a couple of years ago as a Secret Garden Club project and it was so successful, providing chicons on a regular basis between December and March, that I have forced my green chicory plants each year since. This witloof chicory can be sown from April, again, either in modules or straight into the open ground. It didn't suffer too badly from the slug/snail invasion, perhaps because the plants were right next to the courgettes which acted as an attractive decoy. The most pressing problem I find with witloof chicory is that the growing plants look mightily like dandelions and if I'm not careful I find myself weeding them by mistake. Once winter is on the way, the world's healthiest looking dandelions can be lifted and cut for forcing, removing all the leaves and stems just above the root before replanting into compost in pots and covering with a bucket to exclude all light. The chicory roots need about three weeks in the dark to produce the new leaves,or chicons. One thing I've learned since writing the Secret Garden Club post is to make sure the plant is dry when you transplant into the pots and that the compost is barely moist. Otherwise you lift the forcing pot to find brown mushy leaves instead of plump white chicons.